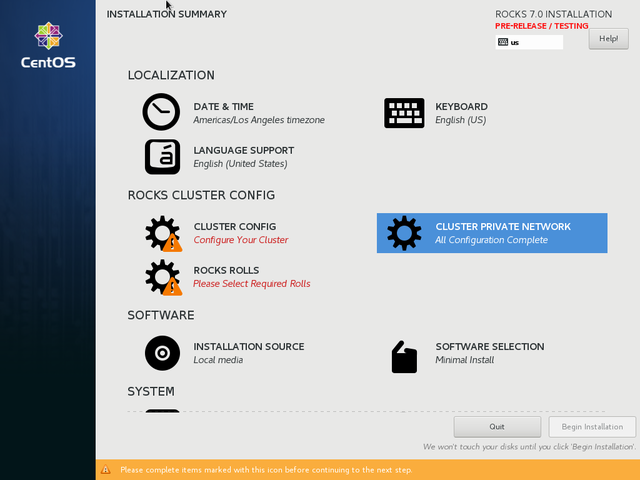 This section describes how to install your Rocks cluster frontend for Rocks Version 7. 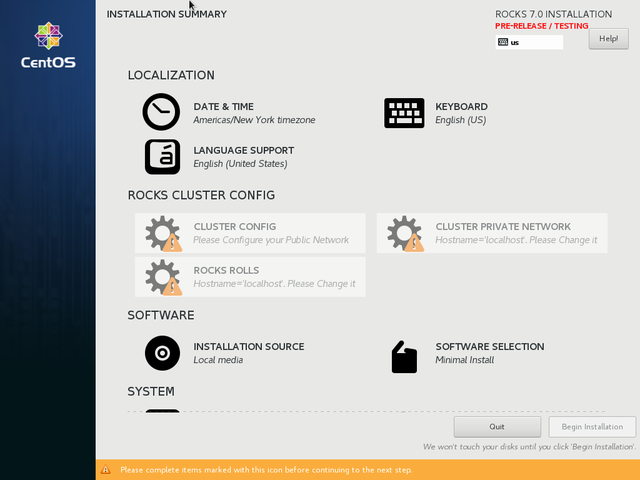 It is significantly different than Rocks Version 6. 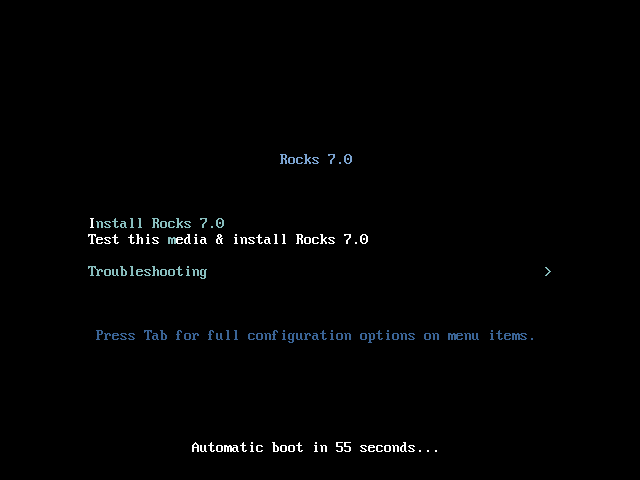 Rocks 7 has only been tested on CentOS. 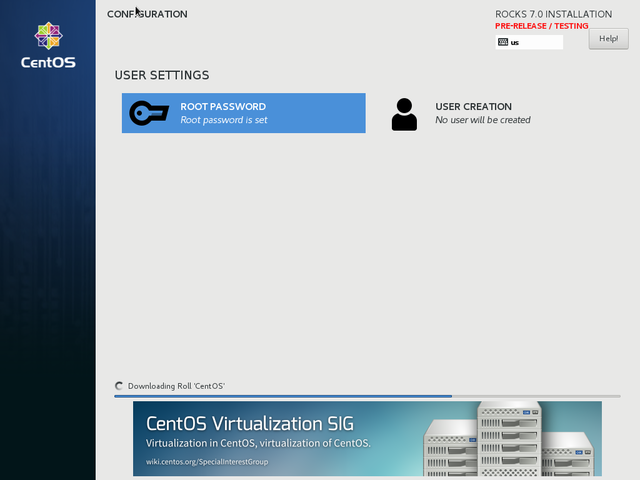 Other versions, like RedHat at the same version number may also work. Insert the Kernel Roll CD into your frontend machine and reset the frontend machine. 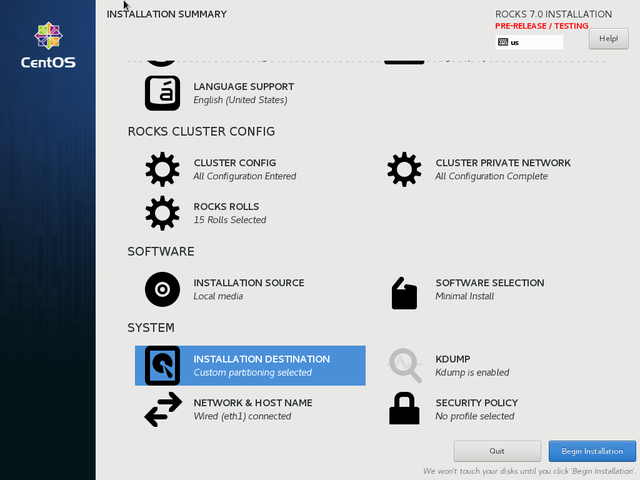 All of the anaconda installer terminals are available. In particular, Ctrl-Alt-F2 accesses a shell prompt on your system respectively. 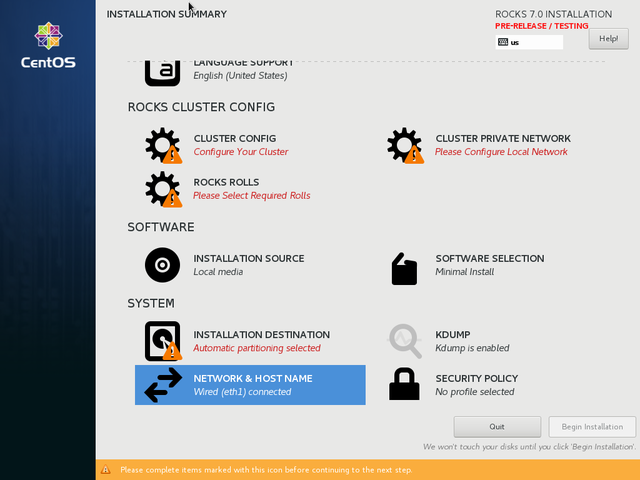 The network configuration screen is in the "System Area" and you need to scroll using the scrollbar supplied by anaconda. This scrollbar can be "thin" or "difficult to see". The following picture illustrates the scrolled down. 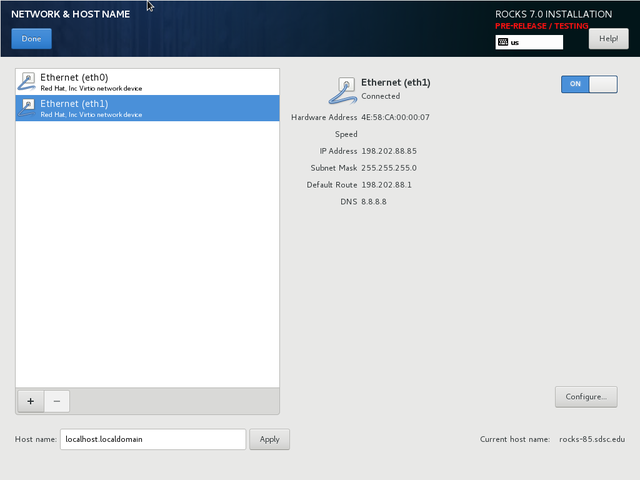 Click on the "NETWORK & HOST NAME" area to configure your public IP and hostname. If you have multiple interfaces, configure only the interface for public access on this screen. It is eth1 in this example. 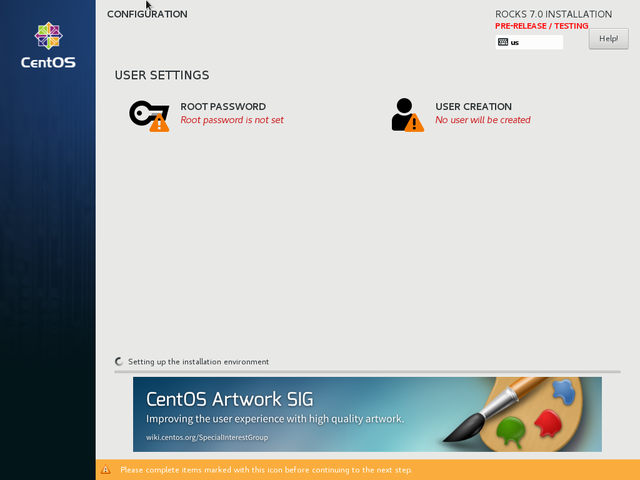 click the "Configure..." button to get to network configuration. 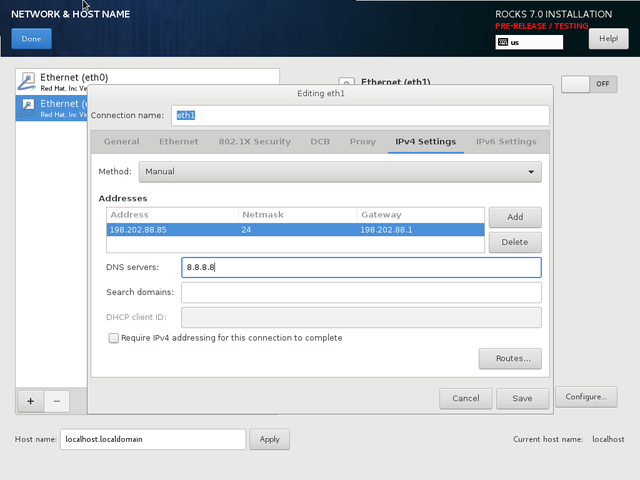 In the following screen, configure the IPv4 address. Notice that it is manual configuration. 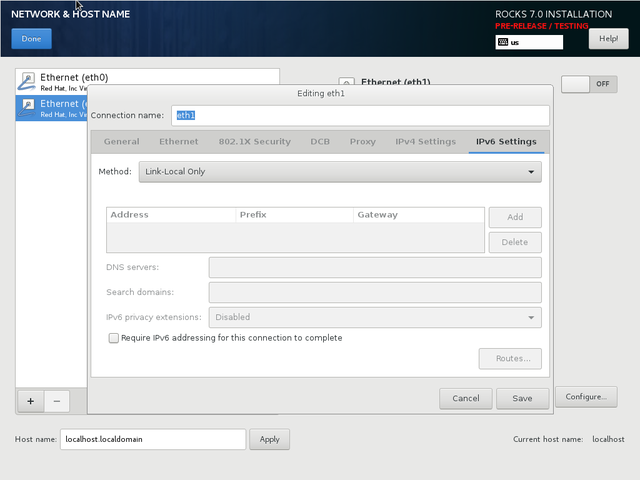 Also configure IPv6 to "link-local only"
After clicking "Save" and "Done" you return to the network screen. 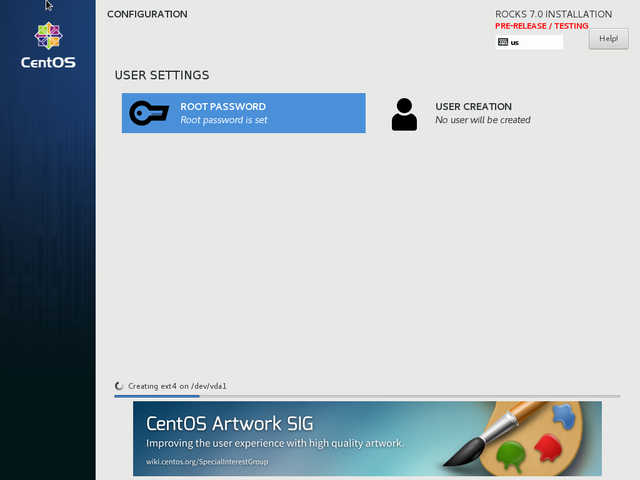 At this point, click the on/off slider in the upper right-hand corner the screen to activate your network interface. If all goes well, you should see both your IP address and DNS name. If you desire to change the hostname, edit the Host name box and click "Apply"
If you are successful, you home screen should now reflect that the network is up and configured. 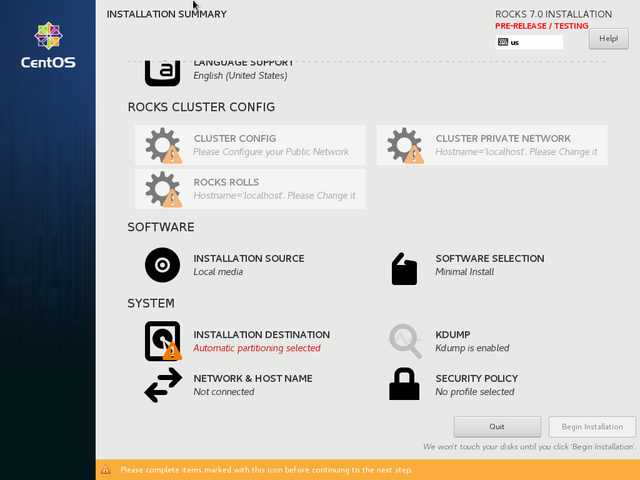 Scroll up to the ROCKS CLUSTER CONFIG area and then click on the CLUSTER PRIVATE NETWORK screen. 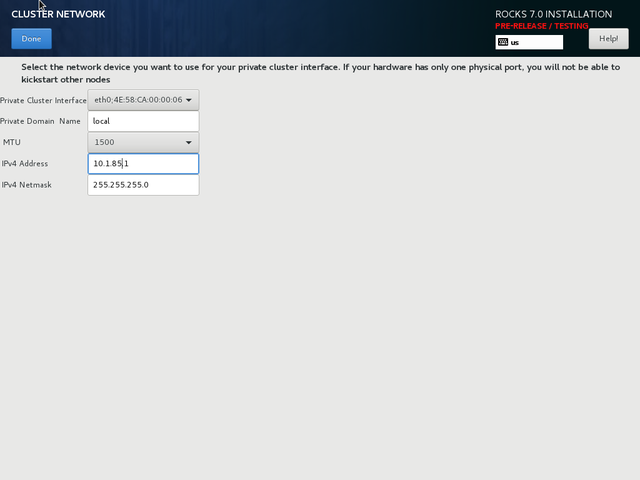 The "private cluster interface" is a drop-down menu selection that allows you to choose any physical interface for the private network. The interface you chose for your public network is not available on this list. If you system has only one physical interface, a virtual interface is constructed for you. 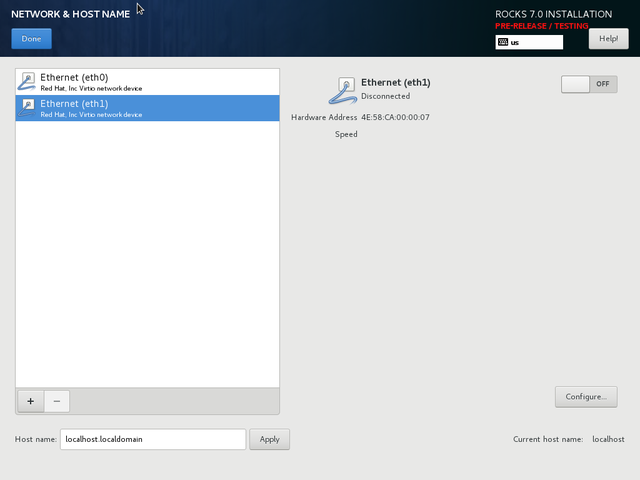 You may select any IPv4 subnet you choose. However, conflict with the public network is not checked. Your public and private IP subnetworks must not overlap. 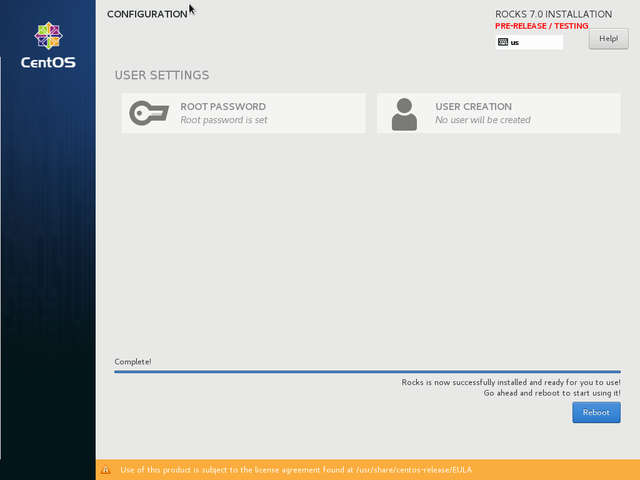 When you click save, the home screen now indicates that this configuration section is complete. 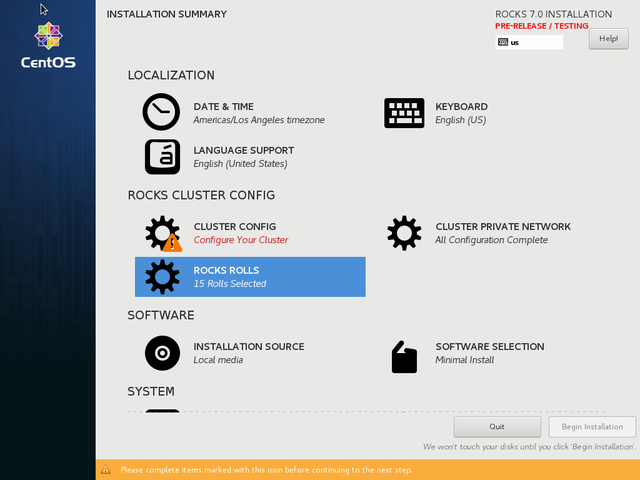 Rolls define your cluster's configuration. 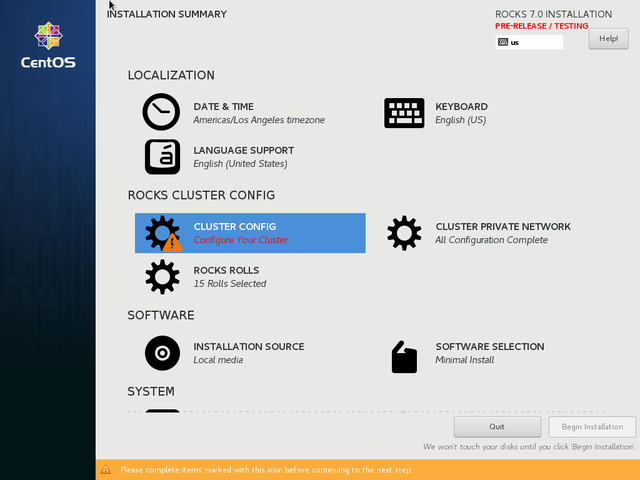 The default location for rolls may be suboptimal for your cluster in terms of accessibility or performance. 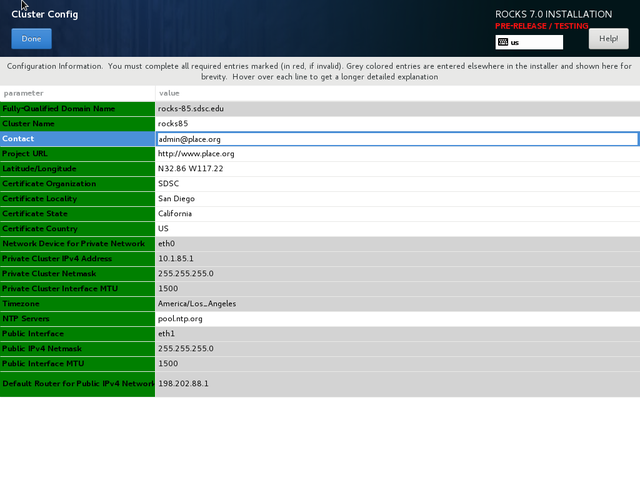 It is possible to mirror the rolls onto any (non-rocks) http (web) server. When you have selected your roll server, click the List Available Rolls button. You have several choices in selecting rolls. You may hit the "Select" word at the top of the column of check-boxes. This will select all rolls available at that server. You may select/de-select individual rolls, too. You can download rolls from multiple roll servers. 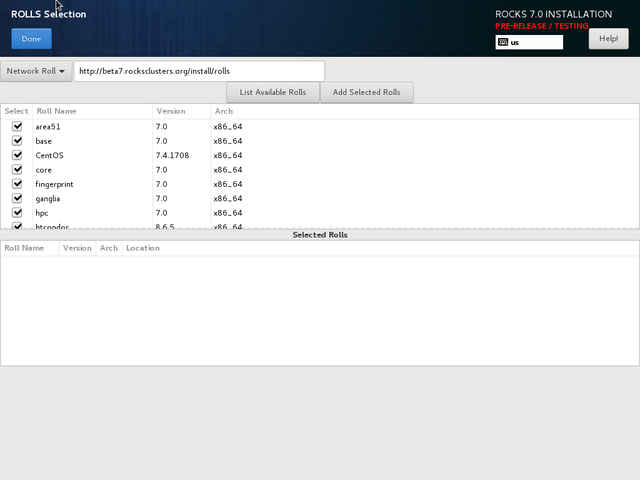 Simple edit the URL of another roll server and click "List Available Rolls". 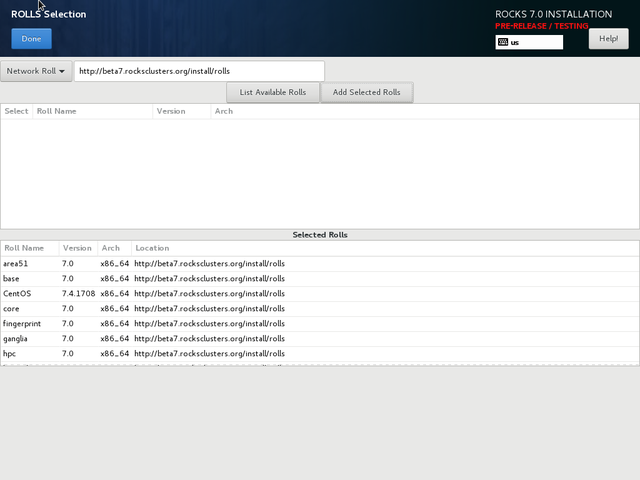 When you hit done and you have selected the required base, core, and kernel rolls, it will take 5-10 seconds for Rocks to build a local database. At this point the screen will look like. This indicates that 15 different rolls have been selected. Any items that need to be completed are highlighted in red. Once a contact has been filled in, the red will disappear. Please also note that grey areas are informational and is data gathered from other parts of the installer. 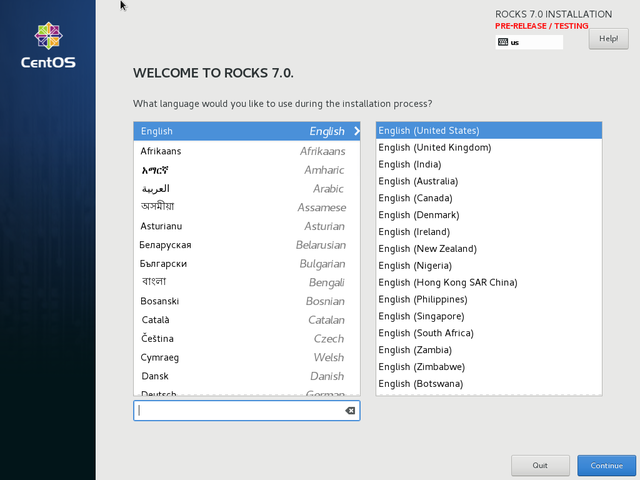 Rocks 7 only supports manual partitioning on frontends. 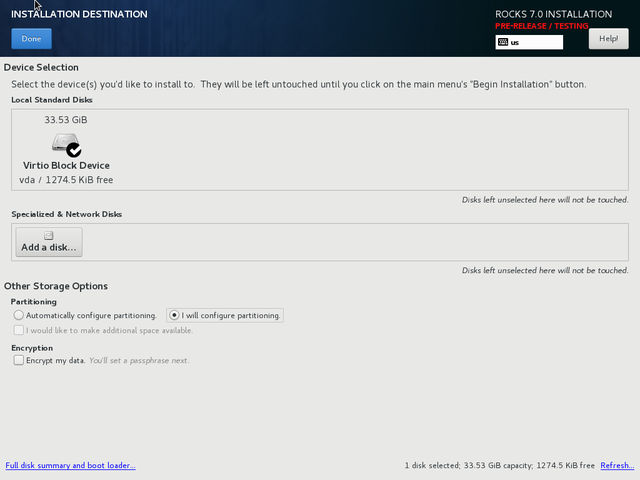 You will need to scroll down to the INSTALLATION DESTINATION screen. 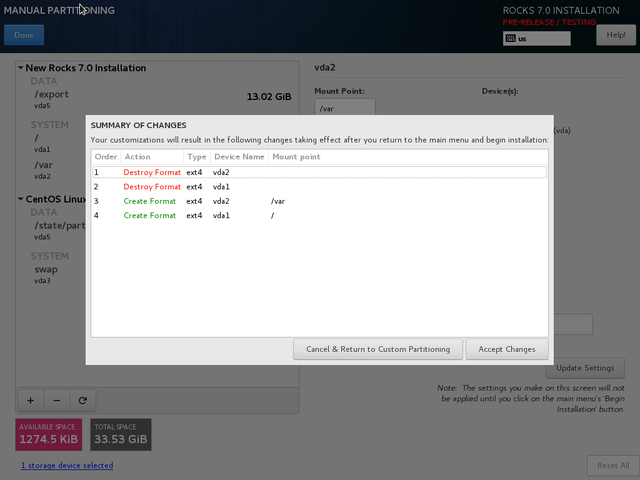 It will default to Automatic partitioning (which uses LVM). Highlight the "I will configure paritioning" button and then click done. At this point, you are in Anaconda's partitioning system and can follow its usual setup. You can setup raid (recommended), or simply create one large "/" partition (not advised, but supported). It is beyond the scope of this document to highlight all of the possible disk configuration options. When you click "Done", you should get a confirmation screen. The following is a sample configuration. There is no "confirm" to "Begin Installation"